Abstract: Direct composite resins in the posterior dentition are a day-to-day treatment modality for most dental practitioners. It is challenging for many operators to produce a restoration that is both aesthetic and functional in a clinically realistic timeframe. This article helps to address this. 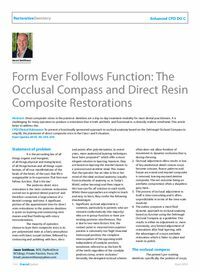 Clinical relevance: To present a functionally-generated approach to occlusal anatomy based on the DeVreugd Occlusal Compass to simplify the placement of direct composite resin in the Class I and II situation. Objective: To simplify the placement of direct composite resin in the Class I and II situation based on the Occlusal Compass.